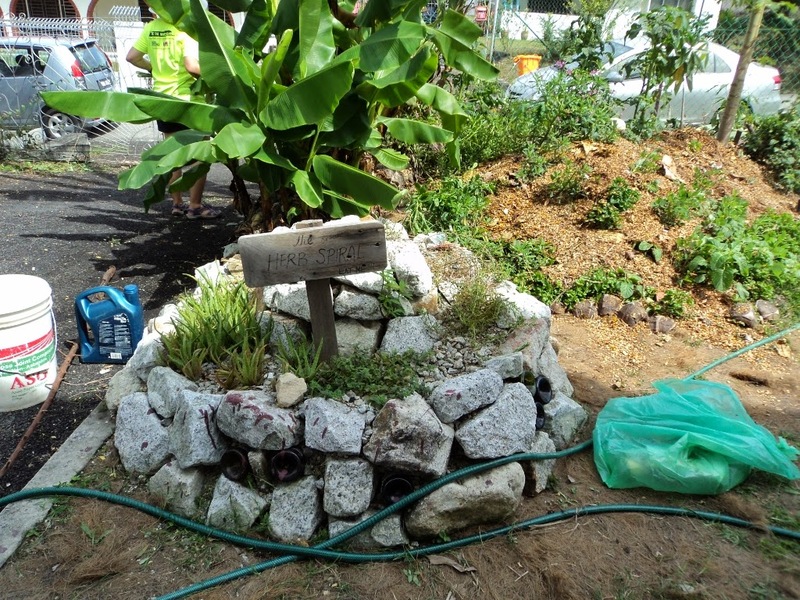 Activity Report: Green Living Visit-and-Volunteer Session at the 'Eats, Shoots and Roots' Edible Garden. Our physical health is interconnected with that of our environment and immediate community. This explains, in part, the rising popularity of edible gardens and community gardens. 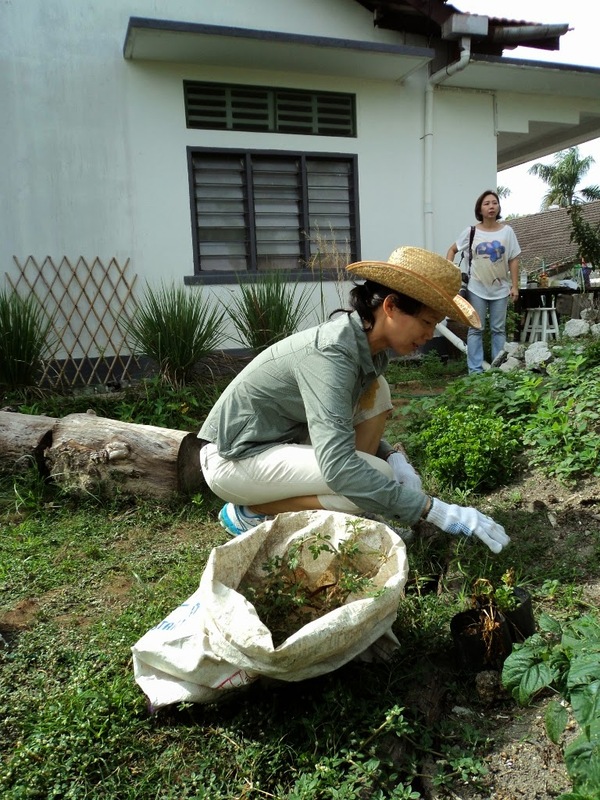 Gardening benefits our physical and mental health; growing our own food even more so. Edible gardening teaches us self-sufficiency, brings us satisfaction, helps us reconnect with the Earth, and puts food on the table that isn't laden with chemicals, heavily packaged, transported across miles or produced by agricultural giants and biotech companies. 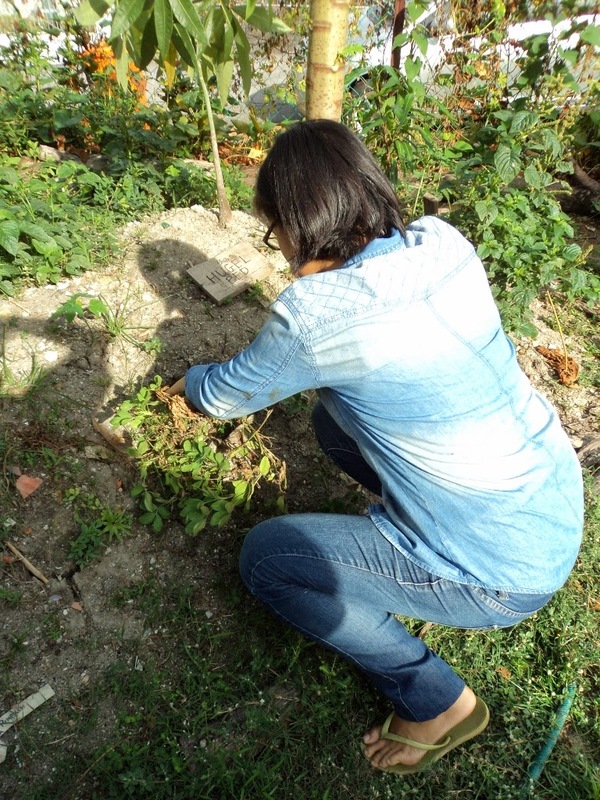 Community gardening enables us to learn from one another and affords us the companionship of like-minded persons. 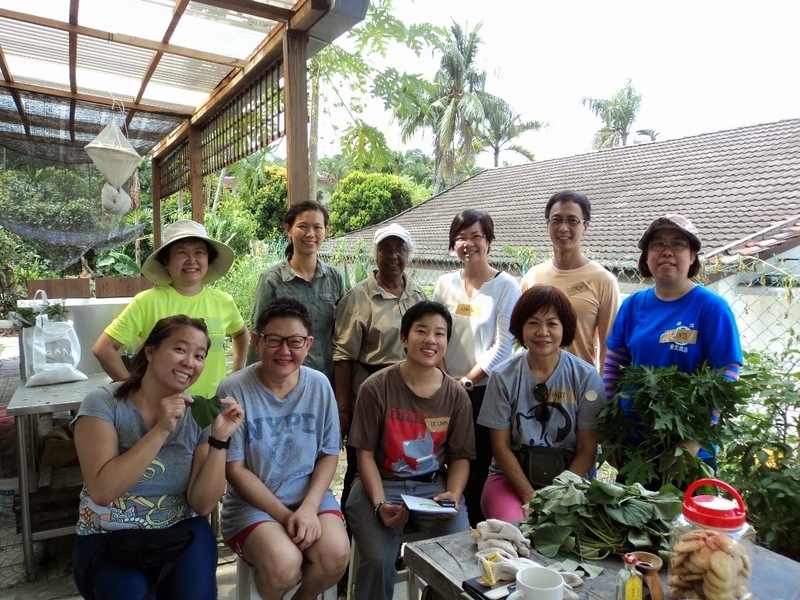 MNS Green Living members and supporters paid a visit to the 'Eats, Shoots and Roots' ('ESR') Edible Garden in Petaling Jaya to learn more about edible gardening for urban households and to contribute our time and energy as volunteer gardeners on Sunday, 6th July 2014. 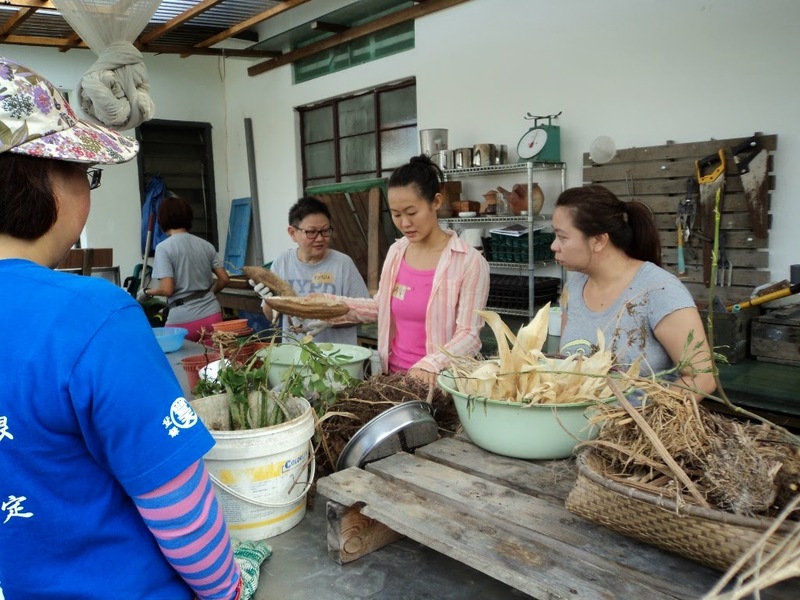 ESR is a social enterprise based in Petaling Jaya with the objective of empowering urban communities and individuals with the skills and tools to grow their own food, and to develop a sense of resilience in the city. It was one of the 6 recipients of the Arthur Guinness Fund and British Council Social Enterprise 'Entrepreneurs for Good' Award in 2013. 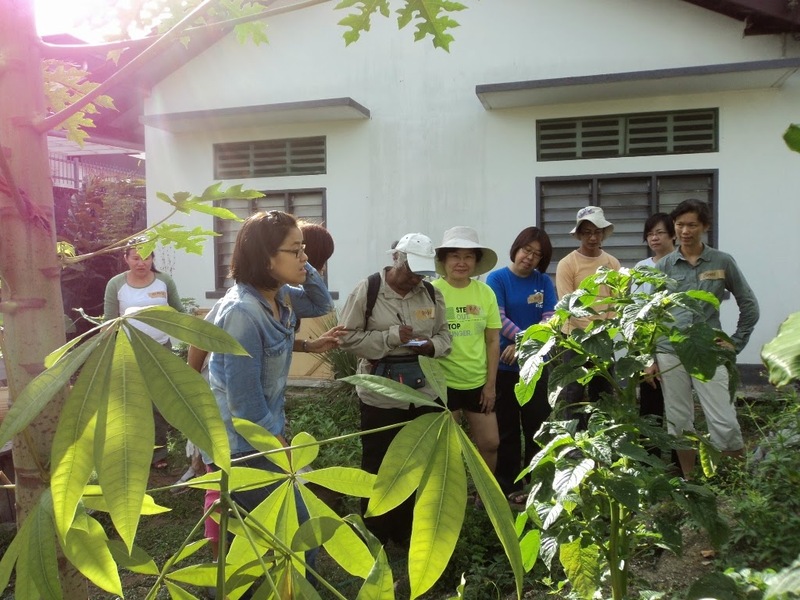 In the course of our 2.5-hour session at the ESR garden in a residential home in Petaling Jaya, we learned about different types of garden beds, gardening methods, the uses of many beneficial edible plants and the ideal growing conditions for various types of plants. MNS members Pasupathy and Sally even brought plants to share and swap with the group. There was much laughter and camaraderie and the session was concluded with a small tea party during which plants were exchanged and vegetable seeds were given out to the thrilled participants. Green Living would like to express our heartfelt appreciation to Shao-Lyn and Beatrice of ESR for their time, patience, guidance and companionship. To learn more about 'Eats, Shoots and Roots', please visit their official website at eatsshootsandroots.org and 'Like' them on Facebook at https://www.facebook.com/eatsshootsandroots. Tour of the front garden. 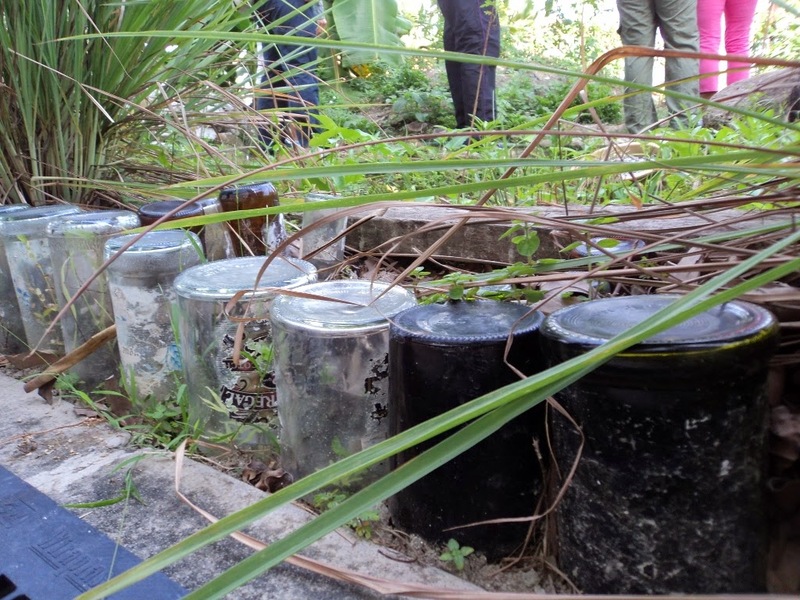 Old glass bottles are repurposed as garden borders. Shao-Lyn explained how a Hugel Bed works. A Hugel Bed is basically a raised garden bed, with logs buried underneath, to grow a garden without irrigation or fertilization. Herb Spirals are space-saving and water-saving as they are constructed vertically. 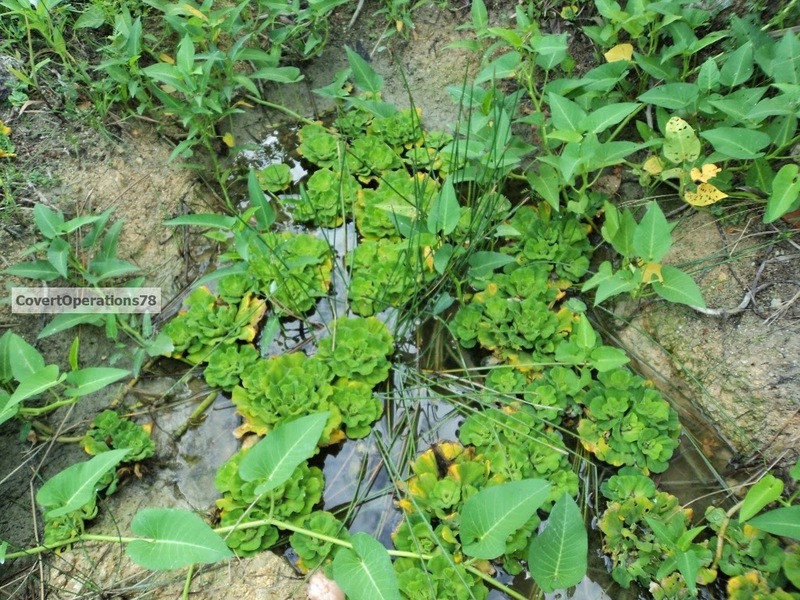 Plants that need the least water, e.g. rosemary, are planted at the top, with the plants that need the most water, e.g. aloe vera, planted at the bottom, so that the water trickles down from the plants on top to the ones at the bottom. A little garden pond with kangkung (water convolvulus) and water lettuce. 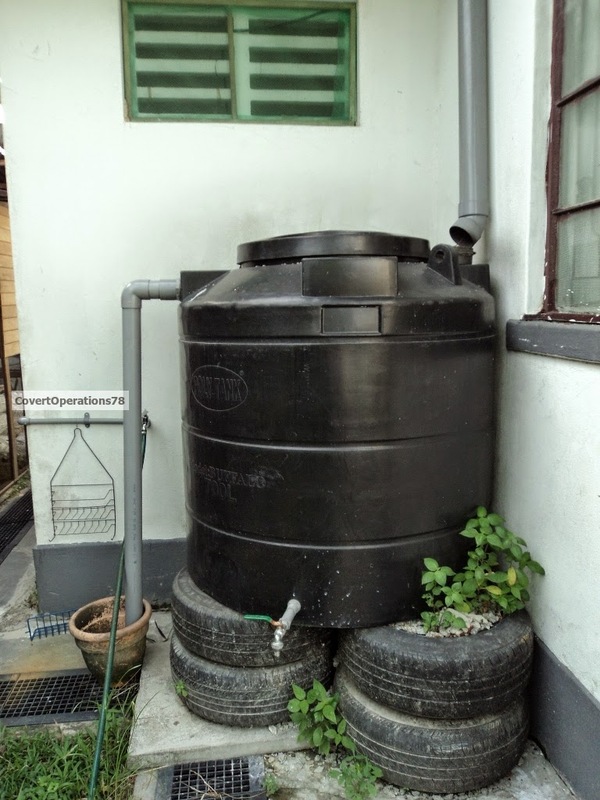 A greywater harvesting and reusing system. Container gardens for edible gardening are perfect if you live in a small rented space or in an apartment. 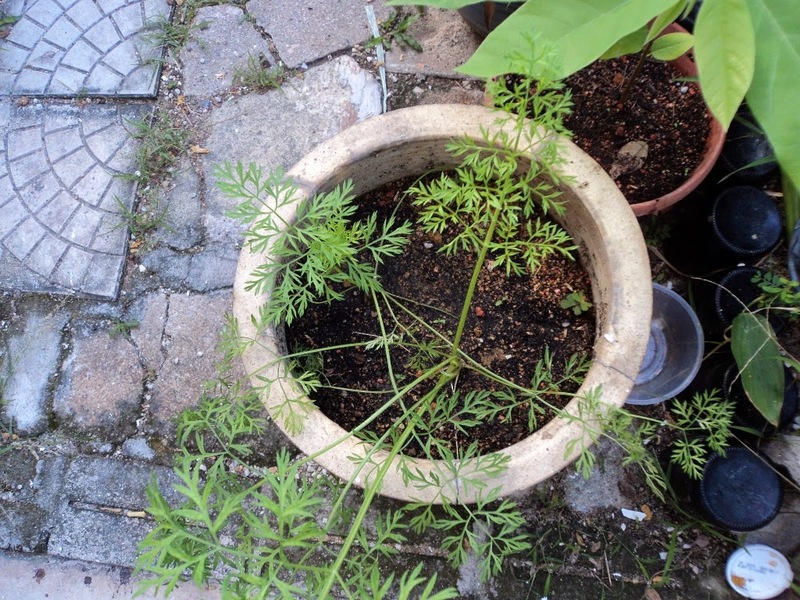 Save your carrot tops and plant them in pots like ESR has done, and you will soon be able to harvest your very own crop of carrots. 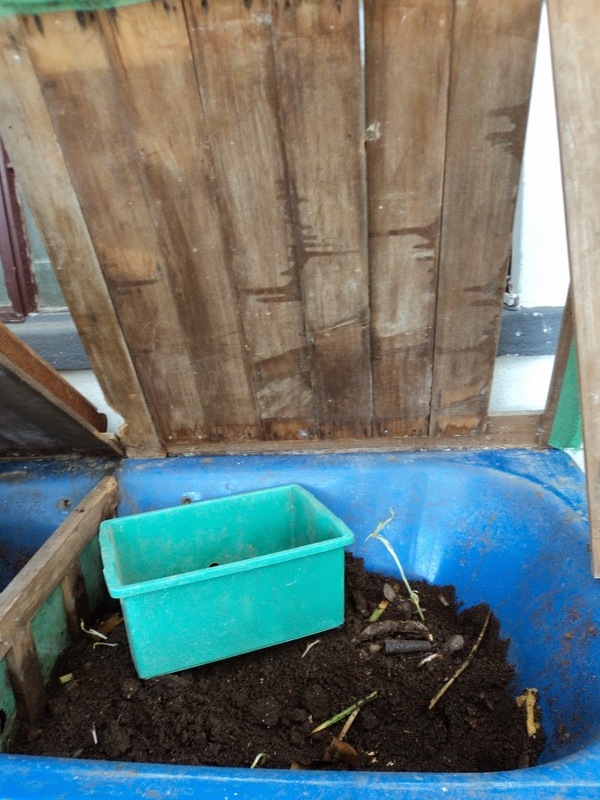 The vermicompost bin is constructed out of salvaged wood and a bathtub that one of the ESR members found by the roadside. The Red Wrigglers in the bin have turned kitchen and garden waste into rich, fertile mulch. ESR's volunteer Beatrice demonstrates potting and replanting techniques. 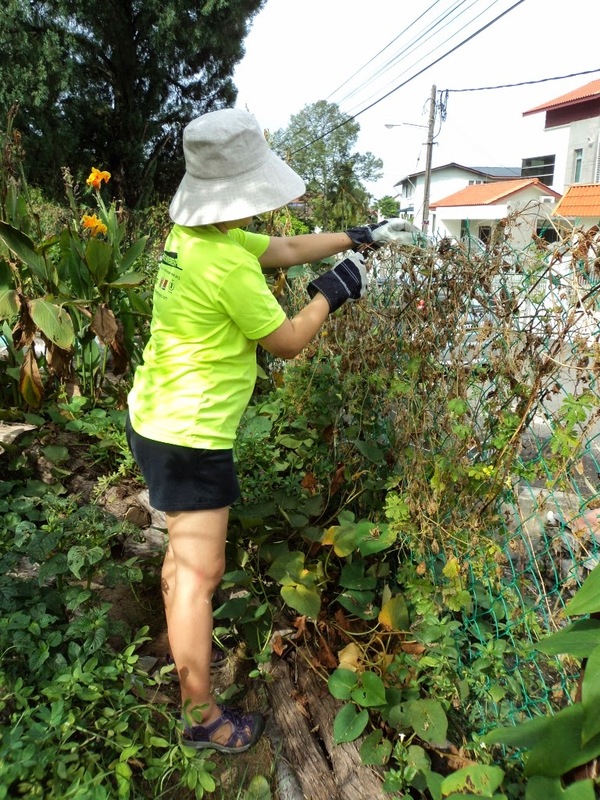 Joanne weeds the Hugel Bed. Beng Beng clears dead creepers from the fence. A group photo of the participants for posterity. 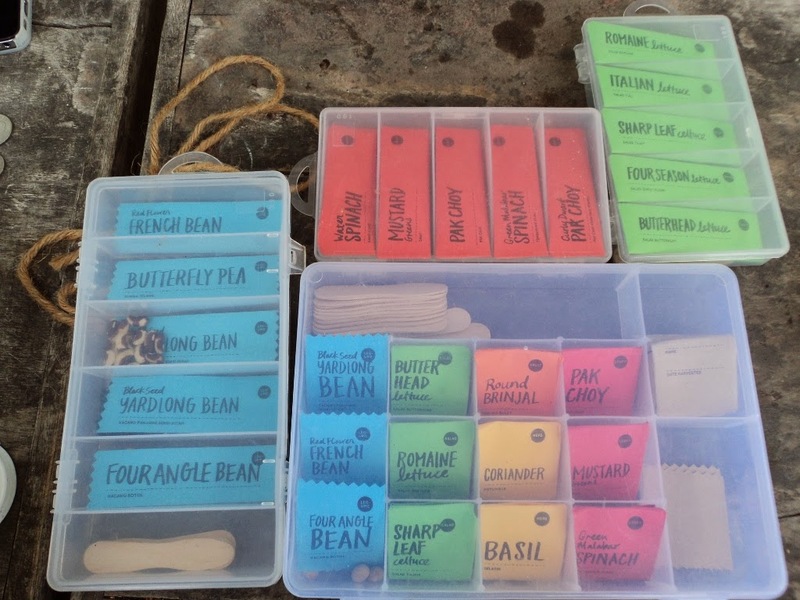 Seed starter kits containing non-hybrid, non-GMO seeds for sale and distribution.